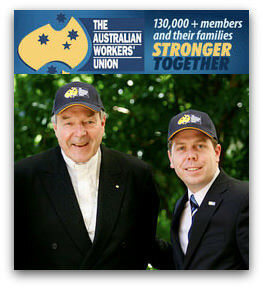 Cardinal George Pell told the Australian Workers' Union National Conference last week why quick action to avoid mass unemployment in the looming recession is so crucial to protect the wellbeing of so many Australians. Cardinal Pell linked this with social capital, which he defined as the 'shared understandings and values [that] help us put our own issues aside and focus on the greater good'. He quoted the Australian Bureau of Statistics' 2006 Aspects of Social Capital report, which argues that people who are unemployed are likely to have less regular contact with friends or family living elsewhere and feel less able to ask them for small favours or help. Cardinal Pell's comments about social capital have direct implications on current debate surrounding the Federal Government's $42 billion economic stimulus package. The measures are weighted in favour of funds for social infrastructure, which would create immediate employment. The bulk of the money would be spent on schools, training centres, community housing, and ceiling insulation. The argument against the package is focused on the need for careful scrutiny before the Parliament commits so such a large expenditure. But some business commentators are concerned that only 12.5 per cent of the amount is allocated to economic infrastructure. ABN Amro Morgans analyst Michael Knox suggested in last Thursday's Australian Financial Review that investing in economic infrastructure 'has more bang for the buck than social infrastructure precisely because private sector businesses come in and multiply the original effect on the economy of the money spent by government'. More spending on economic infrastructure would be expected to encourage business investment in projects likely to create employment in the medium and long term (this was also the promise of Workchoices). But in the short term, many Australian workers and their families would be struck down by unemployment, and this would come at great social cost. Hm! I don't know, Michael! I just don't believe a word Pell says. And I'm old enough to say: watch him, he can be a snake in the grass! Religous input always muddies clear thinking. Ever since the first synod accepted our Sun as the Christian God. Not to be to harsh on believers we are all amde out of sun particles that is why we die because the Sun their God is a ball of gas.